Bruce Nauman’s work brings to life uncanny visions of fragmentation and stillness, repetition and obsession. The de-contextualization of simple actions and the creation of a loop of words and movements introduce an irregular oscillation from the intimate to the inhuman, bringing his work in line with primitive rituals and postmodern theatre. In continuance, we will make some observations about Nauman’s performative actions, in relation to the issue of repetition and their internal connection to the legacy of Samuel Beckett. Despite the fact that the elements composing Nauman’s works, visions of the human body and soft whispers, are not particularly threatening per se, the intentional vagueness of the images and sounds arouse a feeling of unease and distress. In his videos we often see a fragment of a body, repeating the same gestures and sounds; space is almost inexistent: the camera is zoomed to a detail, leaving no sight of the background space; language evolves into new meanings, as the repeated words are fragmented in syllables which form new words –like for example, the repetition of the word “ok” that ends up sounding like “chaos”. This could be a lesson learnt from Samuel Beckett; commenting on the subject of repetition in Beckett’s plays, Deleuze notes that the repetition of gestures leads to a form of automation and lack of meaning; similarly, the repetition of a sound or a proposal leads to a dissolution of meaning. This observation could be also used in regard to Nauman, so as to explain how the feeling of unheimlich culminates within his work. Repetition, as it dissolves our relation to time, implies something like a suspension of time, a blocked memory, a waiting in vain. Indeed, repetition blocks the linear evolution of things in time, by creating a loop of actions or words, which does not lead to a succession of something else. But when talking about “dissolution of meaning”, it should not be considered that it leads to a complete absence of meaning. It suggests that an action or word is stripped of its usual meaning and becomes something different; Nauman’s work illustrates how repetition can form new meanings and new ways of perceiving reality. 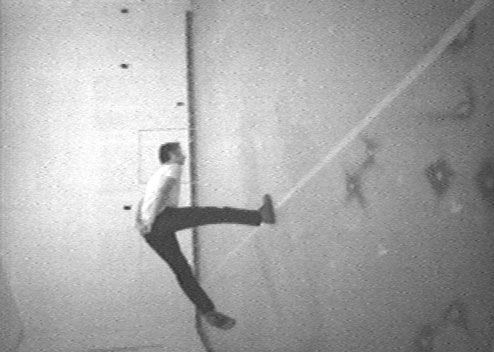 In Slow Angled Walk, also known as Beckett Walk (1968), Nauman tries to reproduce the way Beckett’s Watt and Molloy walk, in an unbalanced manner, slowly, lifting the legs in the air. Filmed with the camera on its side, the image gives the impression that the artist is walking on the wall –reminding us of Beckett’s characters, who seem to be floating in darkness on the dimly lit stage. What is more, repeating an everyday movement in an exaggerating manner and on a predetermined path, marked by the line on the floor, has a certain ritualistic aspect. When repeating an action or a phrase over and over again, the action loses its initial meaning and turns into something different, like a ritual or a mantra. The connection of Bruce Nauman to Samuel Beckett sometimes goes beyond simple inspiration; at times, it could be described as an inner connection. Interestingly enough, his Lip Sync (1969) video, showing a mouth upside down repeating the words lip sync, preceded Beckett’s Not I -a play dominated by a Mouth that speaks incessantly- by three years. The man in Nauman’s video repeats the words in a minimum volume of voice, in a whistling breath that reveals a somehow obsessive mood. The whispering tone makes the words seem unwordly, bringing to mind Steven Connor's observation that “the whisper is not the complement of speech […] it is its fetch, phantom or facsimile”. Therefore, one could claim that the whisper is alienated from logos; it has a strongly corporeal aspect, as it projects the path of breath from the lungs to the vocal cords and the mouth cavity. Indeed, as the man speaks, the movements of his lips, chin and tongue mesmerize the viewer. In Nauman’s works we often see the leitmotiv of the whisper; in his video installations the sound of only one video could predominate over the rest of the projections –that retrocede in silence- like in Clown Torture (1987). Sometimes the visual aspect is missing altogether, as in the sound installation in Tate’s Turbine Hall (2004). But apart from creating a strange effect –corporeal and ethereal at a time-, whispering can make the public more alert than clearly articulated speech, because they need to pay attention in order to understand what is being said; Nauman, just like Beckett, puts the senses of the audience to the test, challenging them to stay alert, so as to understand the action. Still, there is a lot that is missed within this atmosphere of vagueness and uncertainty. Robert C. Morgan observes that “We are lost in a quandary, left with the urge to decipher something that has no context”. However, the lack of “context” releases different forces within his body of work. The repetition of the same words can actually help the person pronouncing them to regulate their breath and heart rate, clear their thoughts and change their state of mind. The videos Elke Allowing the Floor to Rise Up over Her, Face Up (1973) and Tony Sinking into the Floor, Face Up and Face Down (1973) show how stillness, repetitiveness and meditation can bring the performer to an extreme mental and physical state. For both works, the performers follow Nauman’s instructions to lie motionless on the floor; from time to time, they bend their knees and change position, sometimes lying on their stomach and sometimes on their backs. Nauman instructed Elke to think that the molecules of her body were slowly mixing with the molecules of the floor and that she would become part of it. Although she had practiced the performance the day before, Nauman’s instructions had a powerful effect on her: she became frightened that she was filling up with the molecules of the floor and that she couldn’t breathe. After forty minutes she panicked and had to stop. Similarly, in the second tape, Tony started to choke after sixty minutes; he felt that he could not breathe and that he was sinking through the floor too fast and wouldn’t be able to get out. It is interesting to see that the two performers had the exact same reaction to the performance, an extreme attack of stress that affected their breathing. This shows how focusing on one thought –negative, in this case- can have corporeal side-effect and thus become potentially dangerous. In the work of Bruce Nauman, stillness becomes a torture greater than physical violence, whispering turns into a hardly constrained menace and repetition evolves into an impossible task. See Bruce Nauman, Ok ok ok – Raw Material (1990). Video Installation. Deleuze, Gilles (1992), “L’ Épuisé”, in S. Beckett, Quad et autres pièces pour la télévision, Paris: Éditions de Minuit and Sfez, Geraldine (2010), “ Bruce Nauman, Samuel Beckett : Le Corps mis à l'épreuve de la repetition”, Limit(e) Beckett n° 0, printemps 2010, p. 82-103. Beckett, Samuel  (2009), Watt, New York: Grove Press, p.23: “Watt’s way of advancing due east, for example, was to turn his bust as far as possible towards the north and at the same time to fling out his right leg as far as possible towards the south, and then to turn his bust as far as possible towards the south and at the same time to fling out his left leg as far as possible towards the north, and then again to turn his bust as far as possible towards the north and to fling out his right leg as far as possible towards the south”. Steven Connor, “Whisper Music”, Symposium Take a Deep Breath. Tate Modern, London. November 16, 2007. Lecture. [online] <http://www.stevenconnor.com/whispermusic> (Accessed August 5, 2011). Sfez 2010 ibid., p. 82-103. Morgan, Robert C. (2002), Bruce Nauman, Baltimore, Maryland: The Johns University Press, p.7. Nauman, Bruce (2005) and Kraynak, Janet, Please pay attention please: Bruce Nauman's words, Writings and Interviews, Cambridge, Massachusetts: MIT Press, p.177. For example, Jessica Tandy describes the experience of performing Beckett's Not I as terrifying. See Knowlson, James (1997), Damned to fame, The Life of Samuel Beckett, London: Bloomsbury Publishing plc., p.592.